Life in the Pitts: It's like an English fox hunt. Only, with children. LMAO. So funny!!! Poor Chantel. That is awesome. Unless you are Chantal! 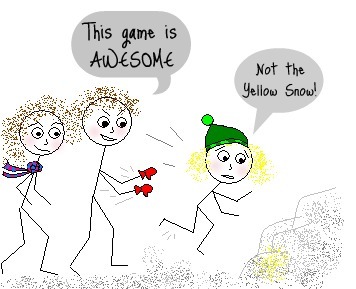 I like the way you remembered to put the yellow snow in the last picture too!! Going to now to read your related posts and laugh at your sister's expense I predict. Seriously...in the hole? Oh, that is priceless. She will never live that down, will she? Really funny story! You need a TV show! I used to love the family trips to pick the tree growing up, but in LA the trees are all half dead by the time mid-december rolls around...it's sad. It won't stop me from making my husband drag home the biggest one that can possibly get through the door though! I don't even know how to respond to this. I love the pics though! I remember very vividly falling in that hole. I ended up with snow all in my clothes, and yet you guys still chased me after! too funny...i bet she remembers it a little differently though. Isn't it funny those "traditions" from our childhood....parents see it one way and the kids another. Ok, I am totally feeling for Chantel. Cause that was me! That is a freaking awesome memory. Too funny. And you know its, Wednesday. Right? i love the last picture with the yellow snow! arent christmas memories the BEST!? That is so funny! I love the way you tell stories!! Does she send you her therapy bills? Hee hee. You crack me up but probably not in the way you crack Chantel up. Every family has a Chantel. Too funny! I'm loving the yellow snow. Sometimes I think of how much I've missed out by having no siblings. And now I realize it's worse than I even thought. I've never had any Christmas-tree-hole incident. Sounds like Chantel has some unresolved issues! And sounds like something my kids would do (if we had snow here)! LOL! This is so funny it reminds me of me and my 5 brothers and sisters doing anything with my parents.Poor Chantel!SOunds like you have loads of great memories! So funny! I kind of can't believe that she still talks to you some days! But, as an older sister, I totally get it so ::high five::!